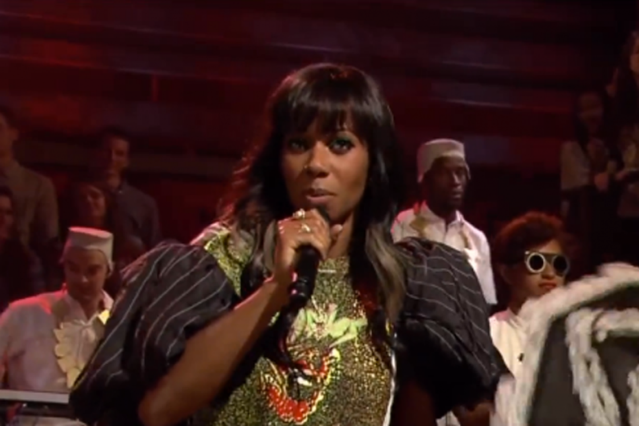 The changes since Santigold last performed on Late Night With Jimmy Fallon could hardly be more striking. Three years ago, when the take-no-prisoners East Coast singer-songwriter appeared to charge through her debut album’s reggae-blunted Brooklyn ode “Shove It,” her name change from “Santogold” was so recent that fellow Philadelphian Spank Rock actually called her the wrong name; Fallon was hosting only his second Late Night ever, in a seat still warm from Conan O’Brien’s departure. Last night, celebrating the release of her SPIN Essential new album, Master of My Make Believe, Santigold led the crowd — and her robotic dancing duo — through a clap-along rendition of youth-without-youth earth-shaker “Disparate Youth.” Last week Fallon was able to secure presidential participation in a “slow jam” backed the by the Roots, and on the same stage, backed by a band dressed all in White, Santigold’s growth was every bit as evident. She sang about overcoming adversity. She didn’t look troubled.